Black Panther – Review | Superhero etc. Hello interweb, Nate here. Non-spoiler opinions? Black Panther himself is lame and boring, the villain is f*cking amazing, and Shuri is cute and funny. The story’s pretty interesting and the politics are thought provoking and interesting. This is probably one of the best Marvel movies out there but also kind of a strange one since it feels so detached from the MCU. While there are jokes present, it’s not as comedic as classic MCU and it’s actually more adult than any MCU film I can think of. I recommend it to anyone who wants a slightly more mature Marvel movie with some racial politics in the mix. Kids might be bored for most of the movie with only a few fun bits here and there to entertain them. From this point on, SPOILER WARNING. You have been warned. This is a great movie. It’s not a perfect movie, it has flaws that I feel should be addressed, but it’s definitely one of the best Marvel movies. The weird thing about this film is usually when I hype up films as much as I did with this one, I usually walk out of it quite disappointing since they usually don’t reach the unrealistic standards I set for it. This film didn’t do that. I was super hyped and excited for this movie and it met the expectations I set for it. I walked out of the movie rather satisfied, which usually doesn’t happen with movies like this. Does it have problems? Yes, and I think the reviewers out there giving this film a perfect score (it literally sat at 100% on Rotten Tomatoes for like a week after it came out) are mostly biased because of the politics surrounding this film. I still think it’s a good movie, but “masterpiece” and “the perfect movie” is laughably hyperbolic. So, what’s the story? T’Challa, aka Black Panther and king of Wakanda (a fictional country in Africa far more advanced than anywhere else in the world), must defend the throne from the villain Killmonger. Killmonger being from America but having ancestry that not only comes from Wakandan blood but also royal blood. This means Killmonger can challenge T’Challa for the title of Black Panther as well as king of Wakanda. Killmonger hopes to gain control of the throne in order to, well, basically take over the world. Kind of. I mean, there’s some racial tension behind his goals but that’s the general plan. The politics are honestly the most interesting thing about the movie. It’s a very black movie with discussion about struggles of black people in America as well as around the world. Killmonger, whose probably the best part of the entire movie, was raised in America and had resentment for Wakanda since Wakandans aren’t doing anything to help people outside their borders while people all over the globe are suffering. Since he grew up black in America, he’s experienced the struggles black people face in this country. Now in case you weren’t aware, I’m a white guy. I don’t have any experience as a black American because of this nor am I able to fully understand the struggles that black American’s face in this country. However, I do recognize that while I may not exactly know what these struggles are specifically they are there. Granted, there are ways people have tried to help black Americans but some of them I don’t necessarily agree with. This is kind of the situation where I recognize the problem, don’t really know any solutions towards the problem, and have problems towards some of the proposed solutions that have been suggested. Such as affirmative action, for example. I hold a strong opinion that you can enjoy art that takes views you disagree with if those views are presented well. Like, I’m an atheist but I can enjoy art that features heavy religious imagery because I can recognize the message in the piece. Like I enjoy Ke$ha’s song “Praying” and think it’s a good song despite it’s heavy message of prayer that I disagree with. 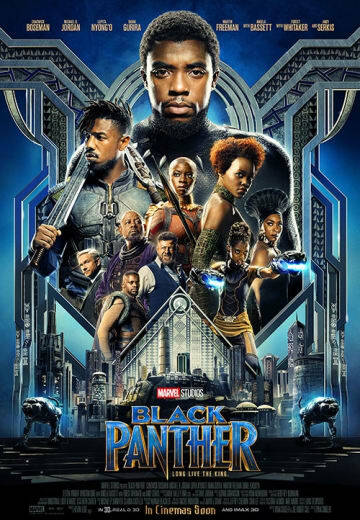 So with that said, regardless of your opinions on the politics presented in Black Panther, I still say you can enjoy this film since it may present you with some thought provoking ideas that you may not have fully thought about. Plus, I just really like how this is a Marvel movie that treats it’s audience like adults. It’s not really candy coating anything, it’s just presenting you with the reality (or at least, the reality through the eyes of this film’s creators) of the situation. Let’s talk about the tone of this film for a second, especially in comparison to the rest of the MCU. As much as I love these Marvel movies, I have developed some pet peeves presented in many Marvel films that this movie avoids. Like, ever since The Avengers ever Marvel film has to be this comedy that shoots a gazillion jokes at you a second. Even in serious moments, Marvel will try to cut the tension with a joke even when it’s unnecessary. Sometimes I just want a serious moment with these characters to be taken serious. When every serious moment is cut with a joke, it makes it feel like the moment is unimportant. It’s kind of like that kid who’s always joking during group projects. You want to get the project done and take it seriously but the guy doesn’t know when to shut the hell up. This film doesn’t do that. Sure, there’s jokes and humor present, but it’s done very well to the point where I can’t think of a joke that didn’t land or made me groan. Sure, this may make the kiddies in the audience bored out of their mind in certain scenes, but sometimes we need a slow moment to really absorb what the film is currently presenting to us. The worst offender of this to me is either Avengers: Age of Ultron or Guardians of the Galaxy Vol. 2. The CGI can get Wonder Woman levels of bad but overall the action is mostly good. The car scene is probably the most exciting part of the entire film. It’s fast paced, lots of cars flipping and swerving, and fun uses of gadgets and super suits. The final fight scene is honestly probably my least favorite action scene of the entire movie. Black Panther and Killmonger falls into the boring Marvel trope of having the villain and hero having the same exact powers and weaponry. Hell, the fight on the train tracks was honestly just kind of boring to me since they were just slashing at each other for ten minutes with the train separating them every once in a while. Now, Black Panther. T’Challa. King of Wakanda. Marvel’s lamest and most boring superhero to hit the big screen. I mean, seriously, there was no character development for this guy whatsoever. He didn’t learn anything new, he didn’t really change his mind on anything, his character didn’t grow, and this movie didn’t do anything to make me want to learn more about him. Captain America: Civil War gave him more character development than this film and he wasn’t even the star of that movie. Like, at the beginning his whole thing is “I’m king of Wakanda, I need to be a good King, we should probably use out resources to help others”. Than Killmonger showed up, took the throne, Black Panther came back to reclaim the throne, and he…goes out into the world to help others. What?! If you saw this movie, give me a character flaw this character posses. Give me an inner conflict he went through that developed him as a person. Give me a change the character went through in this film. Because I can’t think of anything. Like, the only flaw he had is he lost to Killmonger and lost the throne. That’s a conflict, sure, but but what does he learn from this conflict? That he should go back and reclaim the throne? Okay! Sure, why not! Like, I just can’t think of any reason T’Challa as a character should mean something to me at all. I could think of a ton of black superheroes that are far more interesting than T’Challa and who would make a far better movie. Static Shock, Storm, Blade, Miles Morales (although he is getting an animated film), Vixen (who I believe also has ties to African culture I think??? ), Nick Fury, John Stewart/Green Lantern, etc. Granted, some of those characters belong to DC and wouldn’t really do well considering the current position of the DCEU, but those are still black characters I like more than T’Challa. I just wish they did something with his character in this. Like, maybe instead of starting the film with him wanting to help others, maybe he could have the attitude that tradition is important and honoring his ancestors is valuable and then near the end he goes all “Screw tradition, screw the ancestors, I’m the king and I’m going to do things my way!”. Whatever! Now, they didn’t do much with Shuri but I really enjoyed her screen time whenever she was on. She was cute, funny, and had all the neat gadgets and gizmos that Wakanda used. Plus, I just liked her personality. Don’t really have much to say other than that. Overall, I give this movie an 8/10. Had a great villain, thought provoking message, treated the audience like adults, and had an interesting mythos surrounding it. The only issue I really have with the entire film was how boring the main character was. Unfortunately, he’s the main character. He’s kind of the guy you’re suppose to be rooting for and have some sort of emotional connection with. Maybe if I was black I would have a different attitude towards this entire thing, but as it stands now these are the opinions I hold. However, I really encourage you guys to comment below on your thoughts on the movie. I usually like discussions in the comments in general because I like discussing nerdy crap with people, but with this film especially I just really want to know how you guys feel about the entire thing and where we might differ on some aspects of the film. Rotten Tomatoes has always been a rather intriguing site due to how the system works. For example, lets say you and I gave this film a 6/10 review. We both thought the film was only okay, but it’s counted as a positive review so on the site it would claim that it’s a perfect 100%. That’s always seemed rather humorous to me. I do think the film is a little overhyped as a co-worker even claims it’s the greatest movie of all time. I liked it and gave it a 7/10, but definitely wasn’t one of my all time greats. I also did appreciate the lack of jokes that Marvel loves throwing around. It’s good to keep the tension around sometimes instead of constantly breaking it with yet another joke. I was fine with Black Panther though. It’s true that he didn’t really have any flaws, but I thought it was a nice contrast to the rest of the Marvel heroes. Iron-Man dealt with his ego, Thor dealt with learning how to be a mortal and not rushing into fights all the time, Spider-Man deals with everything, etc. It’s kind of nice to have a character who’s already gotten through all of his trials and is now essentially perfect. It wouldn’t be good if that started happening to everyone, but it’s a nice change of pace. Granted, I’m a fan of Kirito and Gary Oak who are portrayed as perfect characters so I just like that archetype quite a bit. Killmonger definitely exceeded my expectations. I thought he looked good in the trailers, but he didn’t get to talk much. His personality in the film was a lot of fun and his leadership was a nice contrast to T’Challa’s. The movie certainly did his character justice. Is that really how RT works? I would think if to guys gave the movie a 6/10 that would make the average critic score a 60%. Why does two 6/10 reviews make it 100? That doesn’t make much sense to me. Idk, a perfect character is just boring in story telling. There’s no character development, which is necessary for good character writing. Idk who Kirito is, but isn’t Gary Oak a brat? Not exactly “perfect”. Idk what Killmonger is like in the comics, he was a great villain here. I believe so. My understanding of it is that any review 6 and higher is counted as fresh while 5 and lower is rotten. So, that’s why the numbers can be rather misleading. The 100% just means that 100% of the reviewers thought it was a good movie. A film with a ton of 6 stars and no negative ones will have a better score than one with a ton of 9 stars, but a few negative ones. It’s like if we both gave a film a 4/10 it would have a 0 and people would think it was awful even though we only thought it was a little sub par. Well, Gary is really mean which I guess it sort of a flaw, but not one that he would change. (Prior to him becoming a nice guy in the sequels) He’s an ace trainer who is also a genius and very nice to his Pokemon. Kirito is a guy who becomes a master at any game he plays within a day and is also a super genius. He’s never really had any issues.